Katie suffers from Xeroderma Pigmentosum. Because of her illness, she's only allowed to leave the house at night. 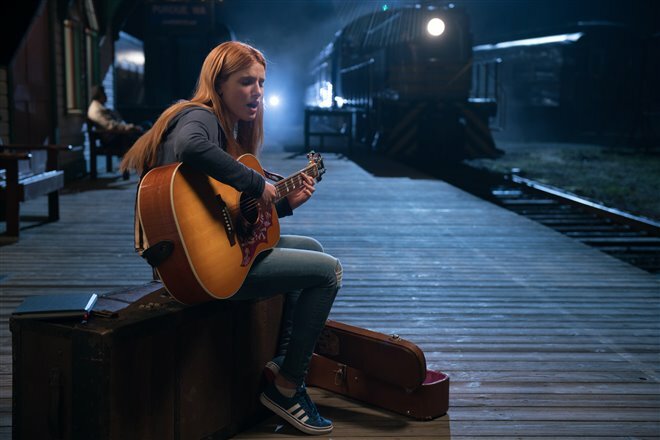 The nights she does go out, she goes to her local train station and plays guitar outside. It is there that she runs into the boy of her dreams and falls in love with him, but over time, she is apprehensive about telling him about her condition. Romance movies are par for the course in Hollywood, but romantic dramas featuring characters with terminal illnesses or rare diseases have become a genre unto themselves. We have seen this recurring theme for some time now. Whether characters are battling cancer like in "The Fault in Our Stars," SCID in "Everything, Everything," or Xeroderma Pigmentosum in "Midnight Sun," the latest film in this sub-genre, these stories are meant to make the audience "ooooh" and "awwwww" at their fairytale romances. The primary objective of films like these is to elicit a few tears out of the audience due to the mere thought of someone dying tragically young. Every so often, they get us hook, line, and sinker...not so much this time. "Midnight Sun" is directed by Scott Speer, who has helmed films like "Step Up Revolution" and "Status Update." The screenplay is written by first-time screenwriter Eric Kirsten, who adapted the story from the Japanese film "Taiyô no Uta." It stars Bella Thorne as Katie, a recent high school graduate who suffers from Xeroderma Pigmentosum (X.P. for short). This means any sunlight exposure could have fatal consequences for her. She has been homeschooled by her father Jack (Rob Riggle) her entire life and only has one friend named Morgan (Quinn Shephard). Katie has a crush on a boy named Charlie (Patrick Schwarzenegger), who she has watched skate by her window for years. ~*IF ONLY HE HAD LOOKED UP.~* On her graduation night, Katie heads to the train station where she plays her guitar and sings. By pure coincidence on that very night, Charlie happens to walk by, hears her singing, and immediately falls in love. After a few awkward interactions, they hit it off and start dating. Still, Katie doesn't want to tell Charlie about her illness which, *~shocker,~* will likely cause problems for them down the line. We have seen dozens of movies with the same general premise as "Midnight Sun," including but not limited to the ones we mentioned in the above paragraph. Some of them are good ("The Fault in Our Stars," "Me Before You"), and others are awful. "Midnight Sun" definitely falls into the latter category. Movies about teenagers who have illnesses or diseases that are successful and well-made manage to be both touching and emotional. These films handle their protagonist's ailment with honesty and sincerity. "Midnight Sun" fails to do this on every conceivable level. It merely uses X.P. as a plot device to create conflict and drama between the two main characters. It doesn't actually convey the real problems and pains those who suffer from X.P. deal with on a daily basis. None of the emotions feel earned because of the terrible script and the stiff, unnatural acting from the two lead actors. 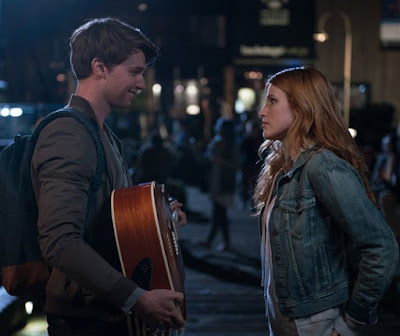 It is painfully obvious that Bella Thorne and Patrick Schwarzenegger were only chosen to star in this film because of their looks, not for their acting abilities. Bella Thorne sounds drunk/stoned as she delivers most of her lines, and Patrick Schwarzenegger attempts to rival Alexander Skarsgård as "most Wonder Bread-iest actor" of all time. The movie's one saving grace is Quinn Shephard, who manages to give a halfway decent performance as Katie's (frequently discarded) friend Morgan. 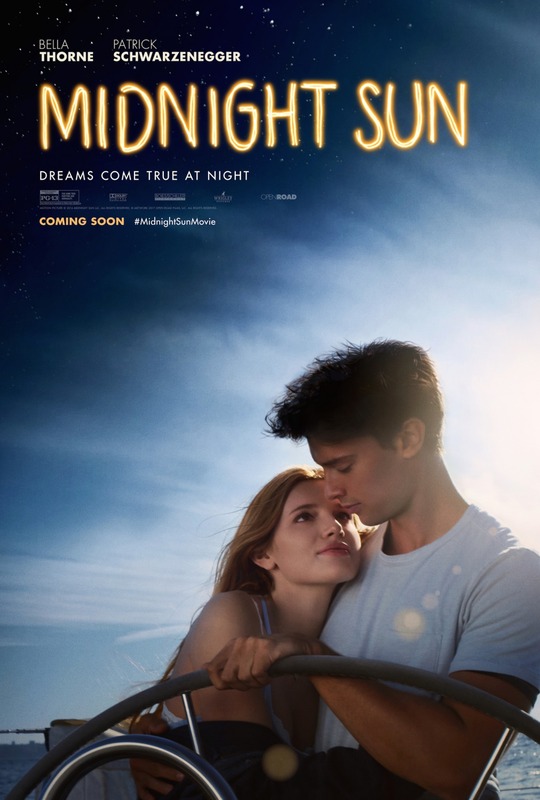 "Midnight Sun" hits every romantic drama cliche in the book. It is completely predictable. Within the first few minutes, we knew exactly how it was going to end. We don't mean in general. We mean down to specific, exact plot points. It is that expected. This is a very sanitized story that just barely holds together so a couple of beautiful looking teenagers who would have an otherwise perfect existence can experience a little tragedy in their lives. A bad script, its awful dialogue, some stiff acting, and a predictable plot makes this teen drama a wet fart of a movie. You should absolutely skip this one if you are anywhere outside of its exact target audience demographic.